While in the big city, Mr. Squash and I went to a vintage lighting store we had heard about. We were both blown away by the amount and beauty of so many vintage, restored light fixtures! They had sconces, chandeliers, ceiling lights, bridge lamps, torchieres...the list goes on and on. There was also a good deal of refinished oak antique pieces at fairly reasonable prices. If the car had more room, I think a few of those pieces would have come home with us! 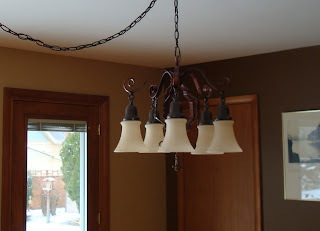 What did come home with us was a gorgeous, restored chandelier dating about 1910-1920. My pictures do not to it justice, but you can get a bit of an idea! The fixture itself is a sort of copper color with touches of green here and there. The shades are an Art Deco style. We had numerous choices for the shades - and it's nice to know we can change them to something else down the road if we wish! This is the portion that had the electrical connection under it. 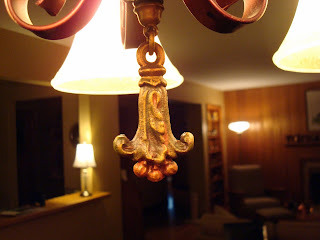 You can see some of the color detail which is also on little finials on the lamp itself, but difficult to see in my photos. Unfortunately the electrical isn't directly over the table, but it came with a chain to swag over, which is how they had it displayed in the shop. 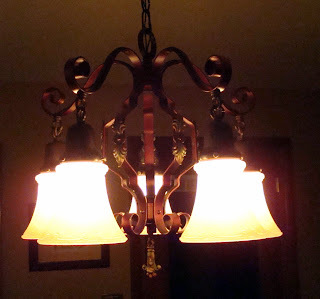 I took a photo after dark - if you click on it you can see the little finials better. Here is a closeup of the teardrop that hangs from the center. Hard to see, but there is a little green on this as well. I was a little apprehensive about how it would look, but once the electrician got it up, I knew we had made the right choice! It's beautiful. You probably already know about Restoration Hardware? We love to get fixtures from them. Very pretty! 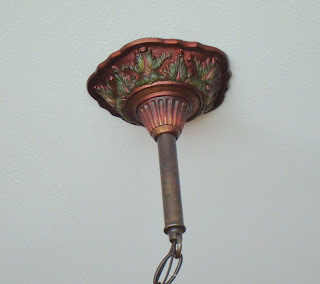 The verdigris on the copper is very attractive. Love it! I see a trip to Spokane and Buggy Barn in my future! It's just gorgeous, Candace. Perfect in your home!! I love beautiful antique finds like that!! It's just too perfect. I honestly love it. You are right it is lovely! Simply awesome! It's a perfect compliment to your craftsman style furniture. Beautiful! Love the green on the copper. Very unique! The details are beautiful, Candace! Candace, that light sure is a beauty! I love the details. It's really a statement piece. What a neat place that must have been! Love your choice. 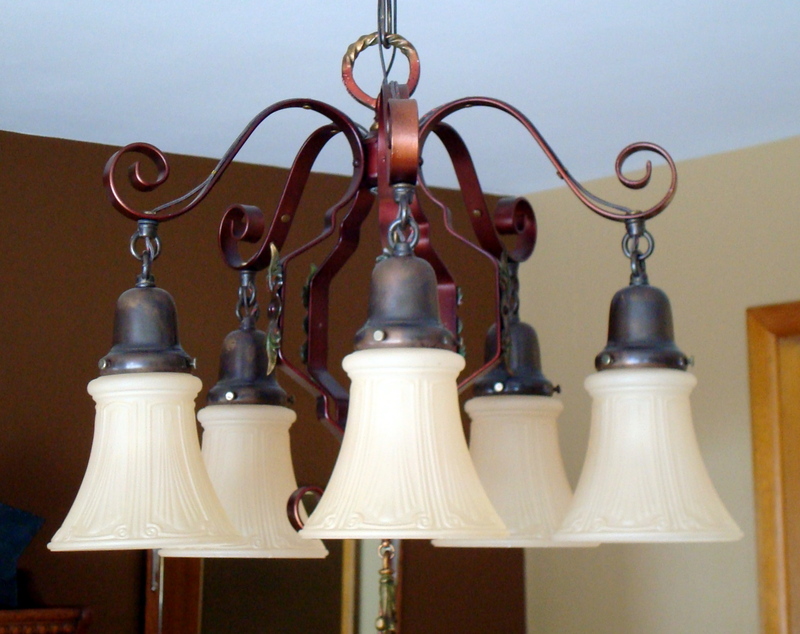 Your new chandelier is a treasure! I would have loved that store. My favorite antique from that "big city" is my sweetie--he was born and raised there!! How beautiful! Thanks for sharing with us! Wish we could find some place like that around here. Beautiful lighting!